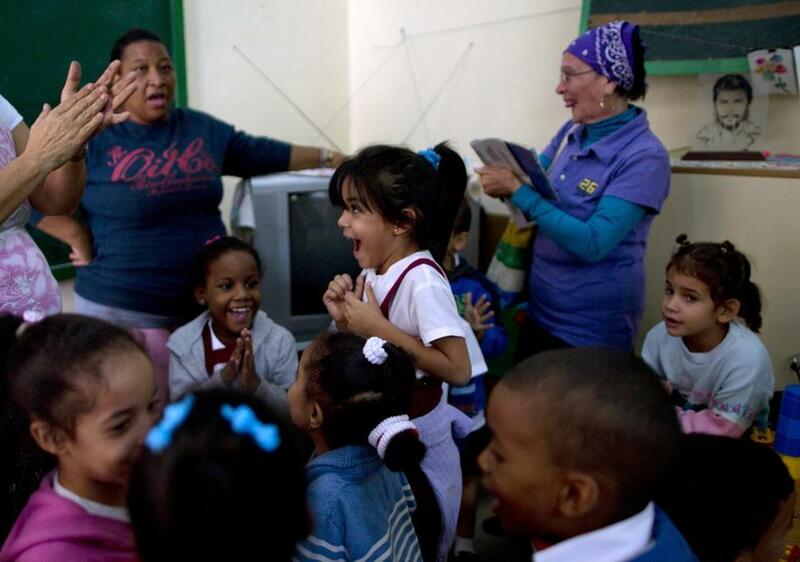 Students and teachers celebrated after listening to a nationally broadcast speech by Cuba’s President Raul Castro about the start of talks to normalize diplomatic relations with the US. President Obama’s announcement Wednesday of a new approach to US-Cuba relations represents a remarkable turning point in US foreign policy. 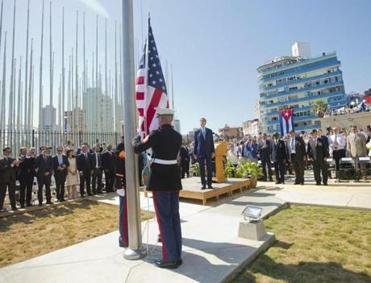 By agreeing to open an embassy in Havana and ease many restrictions on travel to the island, Obama set in motion the beginning of the end of more than 50 years of failed Cuban sanctions aimed at removing the Castro regime. It’s a victory for the Obama administration, but also for the nation and for 11 million Cubans. The embargo that sought to isolate the island just 90 miles from the Florida coast had increasingly become difficult to justify in the face of US diplomatic ties with Russia, China, and Vietnam. The fact is that the Cuba policy has been driven by domestic politics, not foreign policy. For years, though, changing it was considered politically taboo. But polls show that most Americans and younger Cuban-Americans, realizing the sanctions had failed, want the United States to re-establish diplomatic relations and remove economic and travel restrictions. To that end, the Obama administration had been working behind the scenes to normalize the US-Cuba relationship; the first face-to-face meeting between the two countries happened in secret last summer in Canada. But a key obstacle remained: Alan Gross, a US citizen arrested in Cuba five years ago while working as a subcontractor for the US Agency for International Development. His release yesterday morning in exchange for three convicted Cuban spies who had been in federal prison was the last step. In addition to freeing Gross, Cuba also released an unidentified “US intelligence asset” who had been imprisoned for nearly 20 years. Cuba also agreed to free 53 prisoners identified as political prisoners by US officials. Obama’s move toward Cuba was timely. It comes after embarrassing revelations surrounding USAID programs in Cuba, including an effort to launch a Twitter-like social network to stir unrest and another covert program involving hip-hop artists to engage Cuban youth and spark change. Such secret programs were only undermining any diplomatic progress. The two nations’ leaders “made a courageous decision to stop being prisoners of history,” Secretary of State John Kerry said. Now that sanctions are coming to an end, the US policy conversation can finally shift away from the blockade — which barely exists — and focus on half a century of atrocities committed by the totalitarian government on the island. The Castros should be held accountable and the Cuban people deserve better; hopefully engagement will succeed where isolation failed.